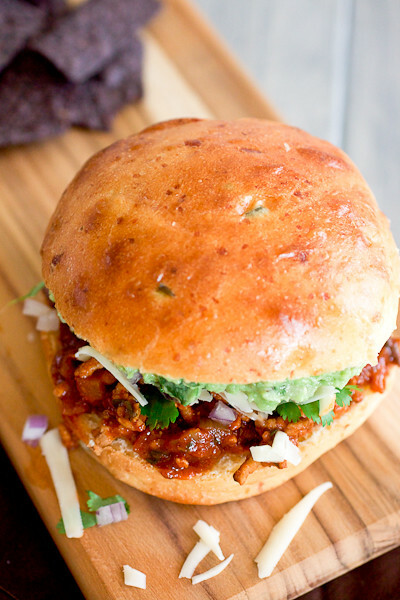 Tex Mex Sloppy Joes: Get your napkins ready! This American classic meal that epitomized my childhood dinners now combines with my utter love for Tex Mex food today. I feel lucky enough, with my aging and increasingly cluttered brain, to have distinct memories of many nights at the dinner table with my family. Family dinner (at the kitchen table) was a basic requirement to living in my parents house. I’m sure my adolescent years were filled with dread about that required family time but today I couldn’t be more thankful for the memories I have about those nights. On one such night when I was maybe 11 or 12, we had taco salad for the first time. It was nothing fancy, as tacos don’t need to be – taco meat with all the fixings over crunchy tortilla chips – but it felt like a revolutionary dinner. Tortilla chips with dinner?! Score!! I don’t remember tacos being in my mom’s rotation previous to that (she may tell you otherwise in the comments here) so this was quite possibly a seminal moment happening. It was also likely that we didn’t eat much Mexican or Tex Mex food aside from tacos or taco salad after that since it turns out that my mom loathes cilantro. I died a little inside when I learned that recently. So these Tex Mex sloppy joes combine an American staple food that epitomized my childhood dinners with my utter love for Tex Mex food today! 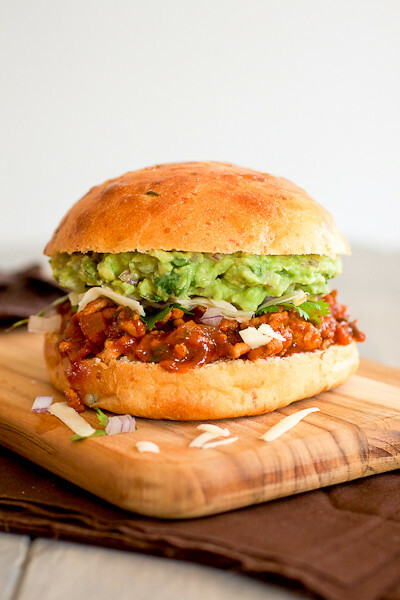 Set between two halves of a soft homemade jalapeño hamburger bun or even homemade potato buns with a hefty serving of guacamole, these sloppy joes are a little spicy but totally homey and familiar at the same time. Get your napkins ready and belly up to the table for this dinner – it’s a favorite we’ll keep coming back to, even if *cough* we eat ours in front of the T.V. Add the tomato sauce, chipotle chile (or powder), oregano, ground cumin, smoked paprika, allspice, cayenne and Worcestershire sauce to a blender or food processor and puree until smooth. Brown the ground meat in a large skillet over medium heat, stirring occasionally until browned, about 10 minutes. Drain off the fat. Warm the canola oil in the pan with the browned meat then add the onions and cook until soft, about 5 minutes. Add the garlic and cook for an additional 30 seconds. Pour the tomato mixture into the skillet along with the beer, ketchup and cilantro. Stir until well combined. Bring to a low simmer over medium heat then reduce the heat to medium-low heat and cook uncovered for 15 minutes. Stir in the lime juice. Season with salt and pepper to taste. Serve on warm buns with suggested toppings, if desired. I also hate the taste of cilantro but that doesn’t stop me from making lots of Mexican food for my family. I just leave the cilantro out and it tastes just fine. These just shot up to the top of my list for menu planning next week. The first photo is gorgeous, can’t wait to try them! That picture is gorgeous – I never thought I’d say that about a photo of sloppy joe’s! And they look sooooo good!! I feel like I’m going crazy…where is the recipe for these sloppy joes? I want to make them and have looked at this post so many times but I don’t see a recipe. Help! I’m having the same issue.. no recipe? Sorry about that! I had some posting issues the other day but the recipe is back up now! So happy to hear you loved them! They’re a big favorite in our house, especially with the jalapeno cheddar buns. Thanks for coming back to comment, Leah!